There is something quite peculiar about the Battenkill in Manchester Center: big, fat trout swim in it, pretty songbirds, ducks, and geese drink from it, beautiful wildflowers grow along it, and people—people like us who generally love nature— just don’t see it. But what if there was a safe, open trail along the riverbanks? A pleasant path, just far enough away from traffic and shopping centers and noise—would you walk it? Did you answer yes? That’s what the folks at Manchester’s Riverwalk Committee, a nonprofit group, are counting on, and they are working hard to give all of us that opportunity. Manchester became a prosperous commercial hub by the mid-1800s, thanks to this hardworking river. Standing near the spillway at the Factory Point Town Green on Depot Street, you see just a small part of the Battenkill. The river rises close by at Mount Tabor in East Dorset, and courses more than 59 miles in all, eventually converging with the mighty Hudson River at Easton, New York; 28 miles flow southerly, then westerly through Vermont. The short section of the river running through Manchester Center has a long story to tell about how the town was settled and grew. In the late 1700s and first half of the 1800s, you would have seen busy mills and factories drawing on the waterpower. You would have perhaps been one of the hundreds of men, women, and children arriving at dawn, toiling away as long as there was daylight, and then wearily trudging home again at dusk, six days a week. Where are all those factories now? And, how did the river become so hidden here? Aside from the natural beauty, there’s so much to tell about this one river’s role in Vermont’s early economy. The design plan for Riverwalk includes the installation of new footbridges. 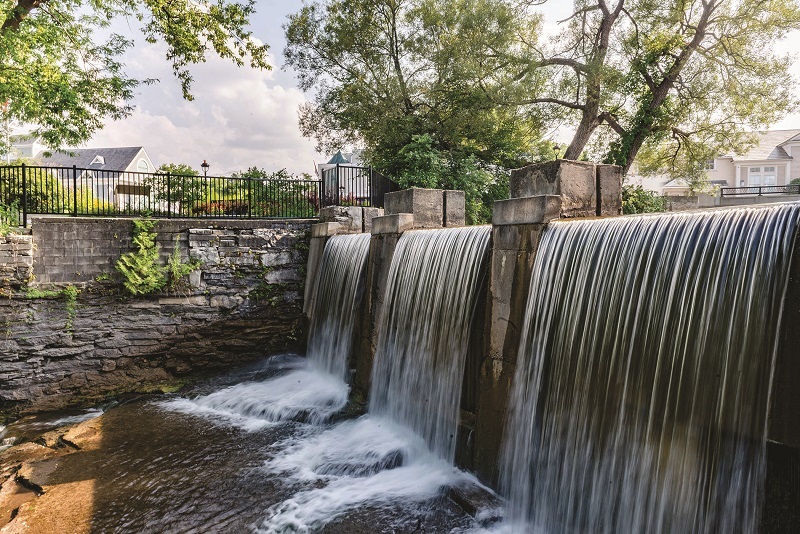 One, spanning the river at the town green, will be something rather special that invites everyone to experience the natural beauty of the Battenkill, with the added thrill of having a perfect vantage point to watch the river splash over the spillway. And downstream, a footbridge is “in the works” for this year; UVM engineering students are assisting the Riverwalk Committee with design and placement. For project updates, and details regarding the Party at the River on July 1, visit manchesterriverwalk.org.